Discrete Mathematics 1 Edition Did you know that games and puzzles have given birth to many of today's deepest mathematical subjects? 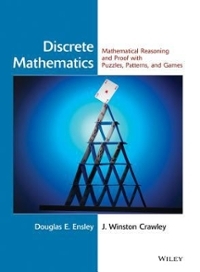 Now, with Douglas Ensley and Winston Crawley's Introduction to Discrete Mathematics, you can explore mathematical writing, abstract structures, counting, discrete probability, and graph theory, through games, puzzles, patterns, magic tricks, and real-world problems. You will discover how new mathematical topics can be applied to everyday situations, learn how to work with proofs, and develop your problem-solving skills along the way. Online applications help improve your mathematical reasoning. Highly intriguing, interactive Flash-based applications illustrate key mathematical concepts and help you develop your ability to reason mathematically, solve problems, and work with proofs. Explore More icons in the text direct you to online activities at www.wiley.com/college/ensley. Improve your grade with the Student Solutions Manual. A supplementary Student Solutions Manual contains more detailed solutions to selected exercises in the text.